NGC 288 (Melotte 3) is an old, low density (class X) globular cluster not far from the south galactic pole. Less than 2° to the northwest is the famous bright galaxy NGC 253. The visual magnitude of this cluster is 9.4. Stars are visible across the front of this globular and I suspect some are foreground stars and not members of the globular. The view was pleasing and improved over the hour I spent observing and sketching this globular cluster. This target is 28,700 light years distant. At R.A. 00 hrs. 53min. and Dec. -26° 35’ this cluster is not a good one for light polluted skies back home in Chicagoland. Here in the dry night air of Arizona the transparency makes this a fine target. 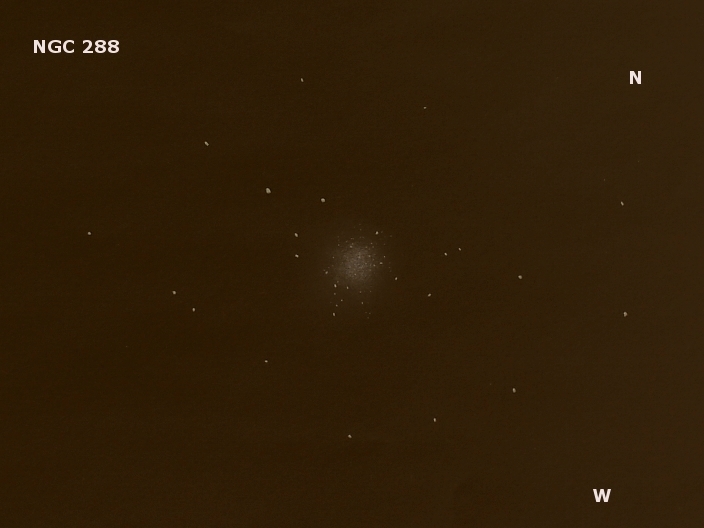 Wonderful sketch of NGC 288 and always a pleasure to see your work. It very much represents what is seen in the eyepiece. Glad to see you are still having the opportunity to enjoy the drier skies of Arizona. Frank, wonderful sketch! Whether it’s the moon or a deep sky object you always do a magnificent job of capturing its beauty. Thank you both for your kind words and keep on sketching. A wonderfull sketch again! I like when the stars are sketching like you do, not perfect small circle.